Are you in a valley of despair? You need to know: you have a choice. You can choose to remain in despair. Or you can choose to take action and defeat despair. Let me show you how. The devil DOES NOT want you to know how to defeat despair. He wants to increase your despair in order to defeat you! Read the Bible’s example of the legalistic nature of Satan as he slinks into the courts of Heaven like a sleazy lawyer and gains permission to torment Job. It’s in chapters 1 and 2 of the book of Job. No matter where you are, God is with you RIGHT NOW! He will help you defeat despair. Now that you know that God is always with you, here’s how you can start getting His help and His comfort RIGHT NOW! 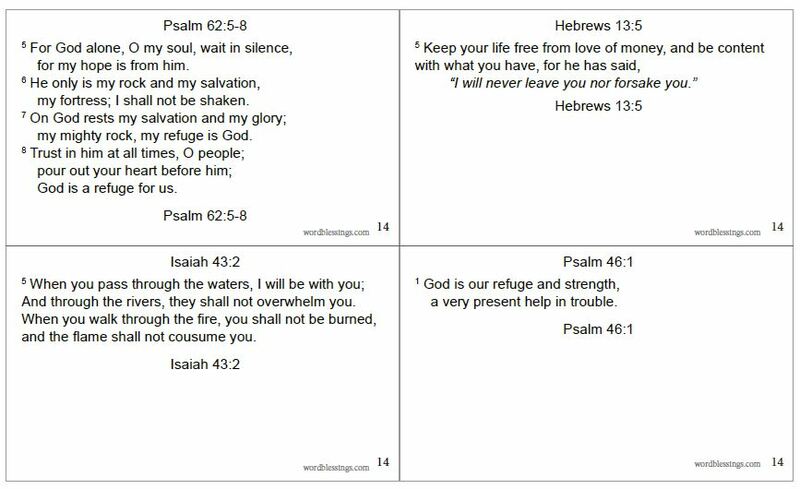 Click Here to view and download a file with 4 Scriptures based on the verses quoted above. Here’s what I urge you to do with these cards. God cannot make a world in which we are free to choose — yet at the same time guaranteeing that we will always choose Him. Before He can act on our behalf, He needs our permission. So until we believe in Him and ask Him, we’re on our own. If some desirable benefit is in the Bible, it’s possible for me to have it. If it’s possible, I want it! If I want it, how do I get it? So what does despair feel like, and what can we do to defeat despair? Imagine yourself trapped in a place of utter darkness, intense pain, total exhaustion, and with the realization that you had zero resources with which to rescue yourself. You are completely alone and without hope. Now, think how your spirit would soar if — just as you were about to give up — a light appeared. In that moment, although you would still be under the difficult circumstance, when you saw the light, you’d be seeing hope! God is light in the dark times and hope in the hopeless times. Best of all, God is right there with you. Turn to Him right now! Here’s how to do that. Read my article entitled If You Don’t KNOW God, Then You Have NO God! It’s all about trusting Him and getting to know Him by knowing and applying His Word into your life. If you want to defeat despair, you need to know God. You need to have a personal relationship with Him. The turning point in our example above is where the psalmist wrote, “…unless I had believed that I would see the goodness of the Lord.” It’s all about what you believe. You will always act according to what You believe. Thus, the more we know of God’s Truth, the better equipped we are to defeat despair. Satan uses unbelief to keep us in the dark, demoralized, and utterly despairing of hope. He lies by denying the goodness of God. We defeat despair by learning to recognize Satan’s lies and then choosing to ignore those thoughts and feelings by focusing on the Truth of God’s Word. Now you have everything you need in order to defeat despair. Will you use it? I just want to say that your emails have been a HUGE blessing to me. I have been facing a lot of trials lately and whenever I need a boost in the Lord, your email comes right on time and seems to be exactly what I’m dealing with!! I’m not even sure HOW I started getting your emails, but God is truly a miracle worker and is blessing me through your writings. Dev, thanks so much for sharing that message! You are most certainly right about how God’s hand is at work to bring you just what you need.